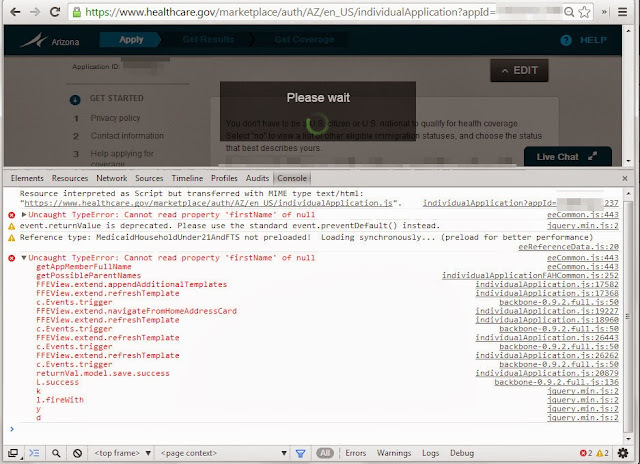 One of my Healthcare.gov application attempts has been stuck for two weeks. Each time I attempt to resume filling out the application, it prompts me to answer a couple questions and then gets stuck on a "Please wait" display. This message stays on the screen until the session times out. This error is occurring in code that appears to be attempting to retrieve the name of someone on my application. A member.personName object in my application is null. The code is expecting that this contain elements named firstName and lastName and suffixName. 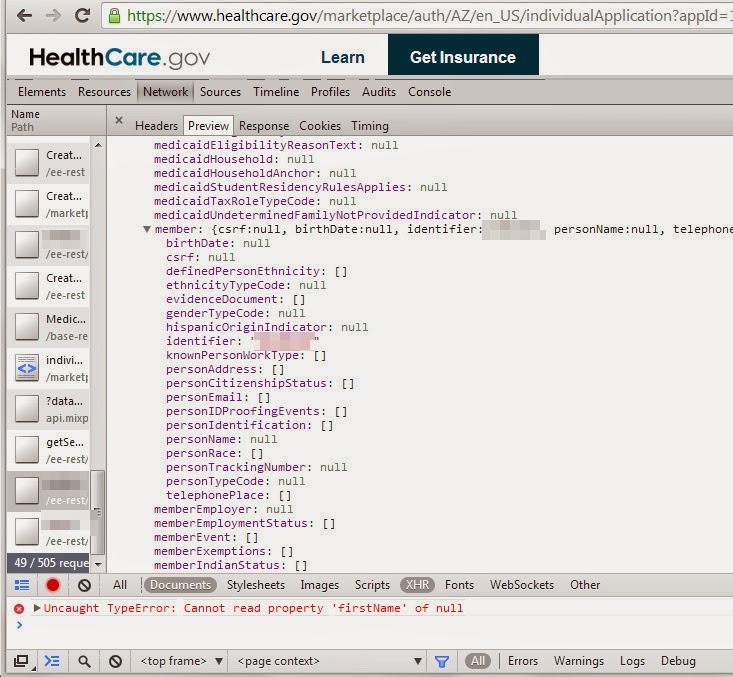 So, why does my application contain people filled with null values? Early in the application process, I was getting a similar error message. I deleted some people from my application using the provided user interface and was able to get further into the application process. It appears that those deleted family members were removed from the application but the data structures in which their data was stored remain; filled with null values and empty arrays. It appears that the application is now getting stuck on those deleted family members. And, now that I'm further into the application process, the options to add the deleted family members back into the application is no longer available. Did the developers of Healthcare.gov not anticipate that someone might use the features they provide to remove people from an application? Did the testers not try entering and then later editing data entered into an application? Although I don't really know what testing was or was not done, I can't help but think that no one strayed off the happiest of paths as they tested this. so how do we escalate this to the debuggers? I have the same issue!